Perimeter security is done for denying access to unauthorized vehicles. Often it is accomplished by the placement of safety barriers around the property. Safety barriers can be placed along the line of the site, within the grounds or outside of the property. When it is placed at the property line, it also serves as a juncture between the private and public area. And by having the barriers inside the property, the visual aspects of the building can be made more appealing. It can be fabricated into virtually any design and is far easier to install than the other materials. It has high strength but the main drawback is that it needs to be well-maintained. You also have to paint them at regular intervals to avoid rusting problems. They are attractive to look at and add a great touch to the architecture of the building. But stone barriers should be larger in size when compared to the other barriers like steel and concrete. Concrete jersey barriers are effective and simple. They protect your building efficiently against trespassers, vandals and adventurers. 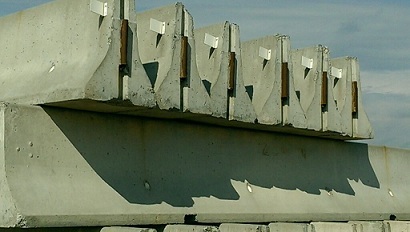 Concrete jersey barriers have a number of advantages. They can last much longer than the steel barriers. In case of any damage, they don’t need much repair. Also, they can be maintained effortlessly. If you want to customize concrete jersey barriers, you can paint your company logo over them. In addition to that, installation of concrete barriers can be done very quickly. There are many dealers who supply concrete barriers for temporary usage too. Other protecting a particular building from pedestrians, safety barriers can also be used for the safety of the general public from high-risk areas like motorways, reservoirs, electrical substation etc. This entry was posted in Business and tagged Concrete jersey barriers, Jersey barriers by [email protected]. Bookmark the permalink.